A town square is an expression of civic dignity and a symbol of urban pride. It is a public space for ceremonies, a perfect venue for recreation, the city’s heart for community gatherings. Brussels has its heritage-listed Grand Place where a gigantic floral composition consisted of innumerable begonias was set up every two years in August; Spain has its Plaza Mayor in Madrid where bullfights, football games and public executions were held; Italy has its Piazza del Campo in Tuscany where a twice-per-year prestigious horse-race is run. So why shouldn’t Melbourne has its own hardscape to play host to its political rallies, symphonies and open markets? Debates and proposals for a Melbourne civic square were raised and suggested since the 19th century. In the 1920s, the Metropolitan Planning Commission recommended a spacious public square to be created in front of the Victorian Parliament to give the city a sense of “community pride”. In the 1950s, the Melbourne and Metropolitan Board of Works urged for the construction of a civic centre, taking example from the New York city where open spaces proved to have the ancillary effect of increasing the value of its surrounding properties. The community's need for a city square was brought to its height in the 1960s where more reports were produced giving numerous reasons justifying the necessity of a city square. Various suggestions were given on a suitable site: the Queen Victoria Market, Exhibition Buildings, opposite Spencer Street Station, the fashionable promenade at Collins Street between Elizabeth and Swanston Streets, the north and the east of Town Hall - all were potential candidates. But it was the current location, the space between the Town Hall and St Paul’s Cathedral that was awarded prime consideration. The Melbourne City Council eventually settled on this strategic location. The process of acquisition and demolition of properties (including the Queen Victoria Buildings and the City Club Hotel) began. A nationwide design competition for the public square was held, and the construction of the dreamlike project commenced. The square was officially initiated on 28 May 1980. Despite the high expectations, the vast sum of monies invested, the enormous time and efforts expended; the final result of the square is an extreme disappointment. The new City Square falls way short of the aesthetic expectations of the public. A peculiar yellow steel sculpture was quickly removed from the square following severe criticisms from the people. Slightly a decade later, half the square was sold and developed into the Westin Hotel, substantially reducing the size of the original square to serve any of its original purposes. Following the opening of the massive Federation Square in 2002, the City Square lost its place as the national identity and a major community playground. The square is now occupied by a few cafes and cake houses, including the famous Brunetti. Once in a while, the square is also used as a venue for certain (usually minor) performances and events, such as the free performances provided during the recent Melbourne International Comedy Festival. The future of the City Square is gloomy and on the brink of hopelessness. 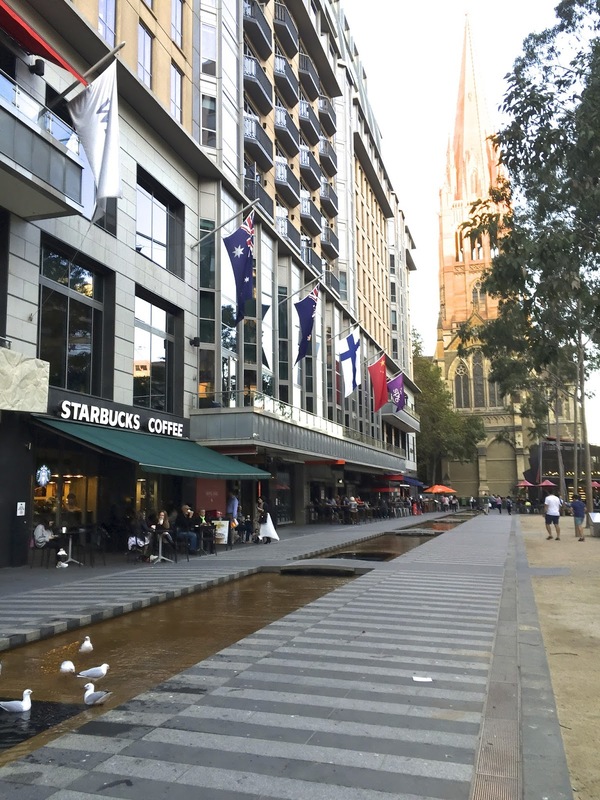 We read from news that the Melbourne Metro Rail will soon be taking over the City Square, forcing the popular Brunetti to seek an alternative location for its current trendy open-air café. So will this be the end of our long-sought civic square? We will soon know for sure. I say time to give up on the idea of this as a valuable open space - Fed Sq has taken up all the cultural activity that might have happened here, and public protest demonstrations prefer the state library forecourt or fed square or marching in the STP Parliament House. But it could be a useful cultural space with say shops and a cafe plaza / arcade/lane at ground level and the city library and expanded gallery to an upper level.